Diosso is a town in the Republic of Congo, situated about 15 miles (25km) north of Pointe Noire in the Kouilou Department. The town is conveniently close to Pointe Noire and has a few attractions including a small museum, a mausoleum, and the nearby Tchimpounga Chimpanzee Rehabilitation Centre which draws animal lovers, but it is not generally the village that attracts tourists. 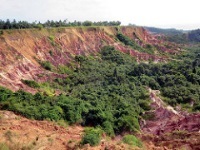 Erosion in the area has resulted in the dramatic scenic splendour of Diosso Gorge, often called the 'Grand Canyon of the Congo'. The lush rainforest is interrupted by red rock ridges and cliffs rising steeply out of the jungle. This stunning landscape can be admired from two viewing platforms accessible by car. One is smaller, part of the dirt road, and more seldom visited, but provides lovely views; the other is larger and near the paved road but visitors shouldn't be surprised if local children have created a makeshift barrier to block vehicles so that they can demand payment for entry. The kids tend to be friendly, so long as you pay the small amount they ask for, and they may well offer guided tours down into the gorge. However, climbing down into the gorge can be dangerous and shouldn't be attempted without the appropriate gear and an experienced guide.